In two previous pieces, THW looked at the Flyers’ captains from their inception through the captainless 1992-93 season and from the start of the Lindros era until the 2004-05 lockout. In this piece, we look at each man who wore the C in Philadelphia since that canceled season. With the introduction of a salary cap after the lockout, teams across the league had seen a ton of turnover by the time the 2005-06 season started. The Flyers parted ways with legend John LeClair, fan-favorite Jeremy Roenick and veteran Tony Amonte. New acquisitions included the great Peter Forsberg and tough defenseman Derian Hatcher, whose contract Detroit bought out. Nine games into that season, Keith Primeau suffered what turned out to be a career-ending concussion. The team initially played well in his absence but dropped off in January. After losing 6-0 to Tampa Bay at the end of that month, Hatcher said, “every player should be embarrassed to show their face out in public.” The next day, the Flyers named him interim captain. Hatcher was a solid choice. Flyers coach Ken Hitchcock was the head coach in Dallas when Hatcher captained them to a championship in 1999, so he knew the kind of leadership Hatcher brought to the table. The team couldn’t quite turn it around, though. They finished fifth in the East and lost to Buffalo in the first round. That series saw the Flyers lose by six goals—twice. It was a disappointing end for a team that had come within one goal of making it to the 2004 Stanley Cup Finals. Primeau announced his retirement during the following offseason, and the Flyers announced later that day that Peter Forsberg would take his place as captain. Hatcher served as an alternate captain for much of his remaining time with the Flyers, which came to an end when he retired after the 2007-08 season. 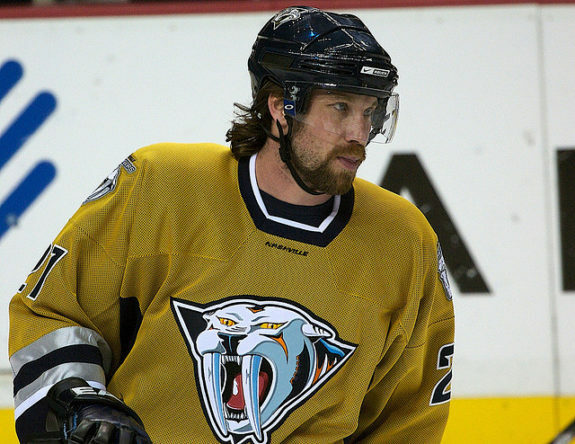 When Peter Forsberg signed with the Flyers, he had two Cups and an MVP under his belt. So when Primeau announced his retirement ahead of the 2006-07 season, Forsberg seemed the obvious choice to lead the Flyers to the bounce-back season fans were expecting. He had developed serious chemistry with Simon Gagne and Mike Knuble the year before. Dubbed the Deuces Wild line, they had scored 75, 79 and 65 points, respectively. Fans couldn’t wait to see what their second year together would yield. Unfortunately, the high hopes for that line—and the team—would not come to fruition. Chronic foot problems hampered Forsberg, and the team as a whole struggled mightily. Eight games in, they had won just one game. Bob Clarke resigned as GM, and coach Ken Hitchcock was fired. They were replaced by Paul Holmgren and John Stevens, respectively, but the shake-up wasn’t enough. By the time Valentine’s Day rolled around, the Flyers were a heartbreaking 15-33-8, and Forsberg had missed a total of 16 games. Nonetheless, the Flyers were still interested in re-signing Forsberg, whose two-year deal ended after that season. He couldn’t commit because of his foot, however, so Homer traded him to Nashville on February 15 for Scottie Upshall, Ryan Parent and a first- and third-rounder. That first-rounder was later sent back to Nashville for the negotiating rights to Kimmo Timonen and Scott Hartnell, who became important pieces for the Flyers. The Flyers, however, finished with just 22 wins, their fewest ever. So while Forsberg’s actual time with the Flyers didn’t meet expectations, he still played a major role in helping the Flyers recover from the disastrous 2006-07 season. Forsberg signed with Colorado again late in the 2007-08 season, playing in nine regular season games and seven postseason games. He played in Sweden for the next two years before signing another late-season contract with Colorado in February 2011. However, he officially retired after playing in two games. That 2006-07 season wasn’t just bad, it was the team’s worst ever. The Flyers finished with 45 fewer points than the year before, the biggest one-season drop-off in NHL history. Not only would the next captain have to deal with that, he’d be trying to fill Peter Forsberg’s skates. But something had to be done. That summer, Holmgren traded Joni Pitkanen, Geoff Sanderson, and a 2009 third-round pick to Edmonton for defenseman Jason Smith and winger Joffrey Lupul. Smith, the longest-serving Oilers captain since Gretzky, was two years removed from leading Edmonton to Game 7 of the 2006 Stanley Cup Finals, which they lost to Peter Laviolette’s Hurricanes. Homer’s moves paid instant dividends. Under Smith’s leadership, the Flyers defense allowed 70 fewer goals. On the offensive side, the earlier trades for Hartnell, Lupul and even Timonen—along with the offseason addition of Danny Briere—led to 32 more goals scored. After missing the 2007 playoffs with just 56 points, they totaled 95 points with Smith as captain and secured the sixth seed. They upset the Capitals in seven games before brushing top-seeded Montreal aside in five. In the Eastern Conference Finals, however, they lost to Pittsburgh in five games. Smith entered free agency after that and eventually signed with Ottawa. After a season with the Senators, he retired. In December of 2007, Mike Richards signed a 12-year extension. 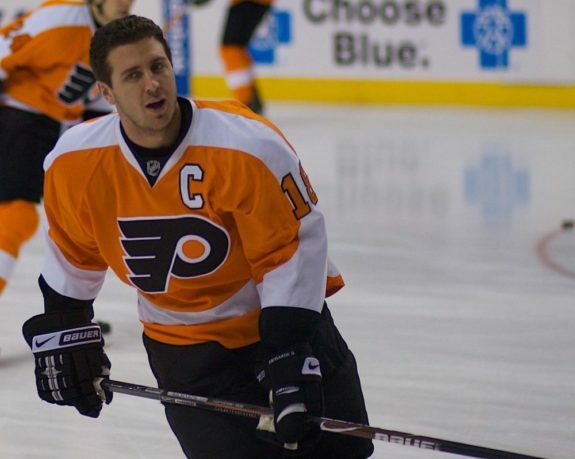 The following September, the Flyers named him their 17th team captain. After three one-year captains, Mike Richards offered the stability that the Flyers hadn’t had since Primeau. With a young, potent core, they seemed poised for continued success. But after just three years as captain, the Flyers traded Richards to LA in one of two blockbuster deals made that day. What happened? Richards had won everywhere he went. He won a Memorial Cup with Kitchener and a Calder Cup with the Phantoms by the time he debuted with the Flyers in 2005-06. His strong two-way play stood out almost immediately, especially on the penalty kill. He missed 23 games due to injury during his second season, but he finished the next year with 75 points and an All-Star Game appearance. During their run to the conference finals that year, he added another 14 points in 17 games. His being named captain seemed almost a foregone conclusion. And in his first season wearing the C, he did not disappoint. The team was inconsistent, but he had his best year statistically. He finished with 80 points and a +22, both good for second on the team. In shorthanded goals, he led the entire league with seven, including his NHL-record third-career three-on-five goal against the Rangers. In fact, no one scored more shorties than he did from his debut until his trade to LA. The team’s inconsistency continued into the playoffs, however, as they lost to the Penguins again in the first round. Richards’ stock continued to rise, though; he finished just three votes behind Pavel Datsyuk in Selke voting. Richie’s first year as captain may have been his best, but his second was the most memorable for several reasons. Homer had upgraded the defense that summer with a big trade that brought in Chris Pronger from Anaheim in exchange for, among other considerations, Lupul. 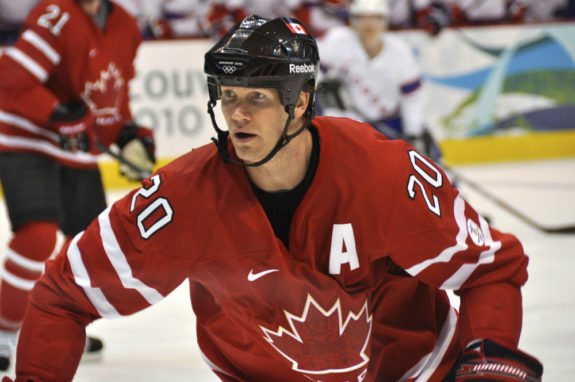 Pronger, 35, was then signed to a seven-year extension. But the team struggled through both inconsistency and injury. John Stevens was replaced by Peter Laviolette in December, and the team managed to stay in the playoff hunt. But it was during that time that Richards’ feud with the media and rumors of excessive partying intensified. Some believed that an ulterior motive of the Pronger trade was to break up the group Richards was partying with. The Flyers’ last two games of the season were a home-and-home against the Rangers. The Rangers needed two wins to make it into the postseason, the Flyers just one. They lost the first in New York, so whoever won the second would advance. The Flyers won in a dramatic shootout, and their most improbable Cup run yet began. The seventh-seed Flyers eliminated two-seed Jersey in just five games behind Richards’ dominating performance, who scored eight points in that short series. In the next series against Boston, the Flyers found themselves down three games to none. Though the Flyers lost Game 3, Richards’ physical play knocked David Krejci out of the rest of the series, and the Flyers won the next four games. At that time, only the 1975 Islanders and 1942 Maple Leafs had won a series after going down three games to none. Richards would do it again with the Kings in 2014, becoming the only player to do it twice. The Flyers then rolled through Montreal in the Eastern Conference Finals, as did Richards himself, scoring what might be the most memorable goal of his career in Game 5. The Canadiens, facing elimination, had a 1-0 lead early in the first period and were on the power play. Claude Giroux flipped the puck out to center ice from behind the Flyers net, creating a race for the puck between Richards and Montreal’s Roman Hamrlik. The two skaters were neck and neck, so goalie Jaroslav Halak came out past the faceoff dots to try to clear the puck. Richards dove for it at the last second and knocked it past Halak, who collided with Hamrlik at the top of the slot. 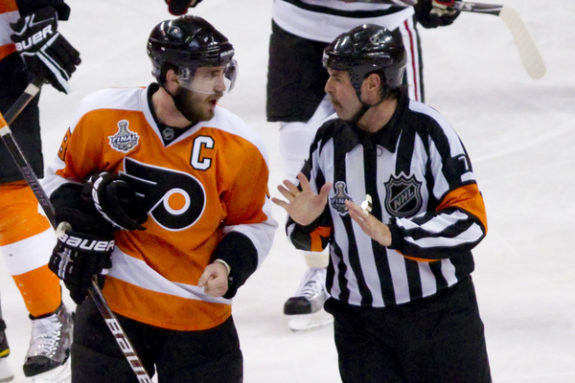 Richards got to his feet and backhanded the puck into the net, tying the game, which the Flyers would eventually win. Unfortunately, they ran out of magic in the Stanley Cup Finals, losing to Chicago in six games. Richards scored just two points in that series, though he finished the playoffs with 23 points in 23 games. After dealing with an unprecedented amount of goalie injuries in 2010—and losing the Stanley Cup on an all-time soft goal—the Flyers opened the 2010-11 season with rookie Sergei Bobrovsky in net. The Flyers were much more consistent that year and led the East for much of it. A Pronger injury in February cost him the rest of the regular season, though, and the Flyers finished the year playing mediocre hockey. In the first round of the playoffs, they needed all seven games to eliminate seventh-seed Buffalo. More worrying was the goalie carousel. Bobrovsky played well in the Game 1 loss, but Brian Boucher would start the next three games. He was then benched for Michael Leighton, who started Games 5 and 6 before being pulled in favor in Boucher, who closed out the series. The second round would be a rematch against Boston. The Bruins again jumped out to a three-games-to-none lead, but unlike in 2010, they clearly outplayed the Flyers in those three games. Laviolette pulled Boucher in favor of Bobrovsky in each of the first three games before naming him the Game 4 starter. But there was no comeback that year. Boston swept the Flyers, and while the biggest disappointment was in net, Richards scored only one goal during the 2011 playoffs. Those struggles in net turned out the be a major impetus in driving Richards out of Philadelphia. The day before the 2011 draft, the Flyers traded both Jeff Carter and Mike Richards in separate deals that shocked the NHL. With the cap space the deals cleared up, the Flyers signed Ilya Bryzgalov to a nine-year, $51 million contract, hoping to end the decades-long search for the next franchise goalie. Richards went to LA, and Pronger was later named the next Flyers captain. After being caught at the US-Canadian border with painkillers for which he did not have a prescription in June 2015, the Kings released Richards. He played for the Capitals in the second half of the 2015-16 season, but he hasn’t played since. Trading a captain can be a big risk, especially when he’s one of the team’s best all-around players. 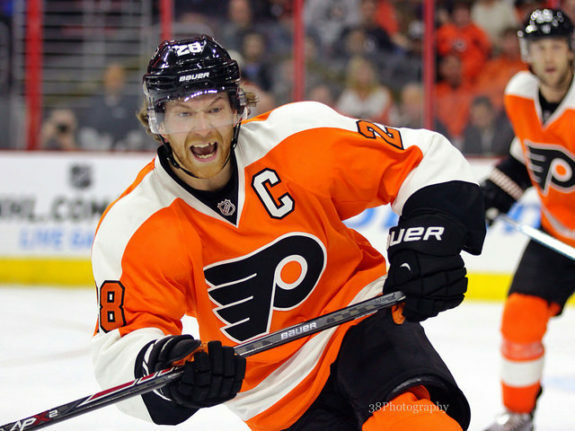 But Giroux had begun to emerge as a future star, and the Flyers had the luxury of one of the NHL’s greatest leaders in Pronger, who was named the captain for the 2011-12 season. Injuries kept him out of 32 regular season games and all but the last three playoff games the previous season, but after a huge roster shake-up, the revamped Flyers were ready to put the previous year’s disappointment behind them. Their new captain could boast an almost unparalleled resume: a Stanley Cup, two Olympic gold medals, an IIHF World Championship gold medal, six All-Star games, a Norris Trophy and a Hart Trophy. Unfortunately, he wouldn’t add much to that resume after becoming the Flyers’ 18th captain. In the eighth game of the 2011-12 season, Pronger caught a stick to the eye. He dropped to the ice immediately, and everyone in the arena could hear his screams. But he returned after missing just six games. He later admitted that he hid post-concussion symptoms, but he felt that he had to get back on the ice. Four games later, a routine hit from Martin Hanzal worsened those symptoms. The next game, played on November 19 in Winnipeg, was his last. He didn’t officially retire, but the writing was on the wall: the Flyers would lose another world-class leader to post-concussion syndrome. Without him, and with an erratic and eccentric Bryzgalov in net, the Flyers still secured the fifth playoff seed. The first-round matchup against Pittsburgh gave fans a glimpse of the Flyers next captain, Giroux. They lost in the second round to the Devils, but fans could at least look forward to the Giroux era. Giroux wasn’t named captain until January 2013, after that year’s lockout, but the 2012 series against Pittsburgh was his coming-out party. Few doubted who Pronger’s successor would be after seeing Giroux begin Game 6 by leveling Sidney Crosby and scoring a goal just 32 seconds in. 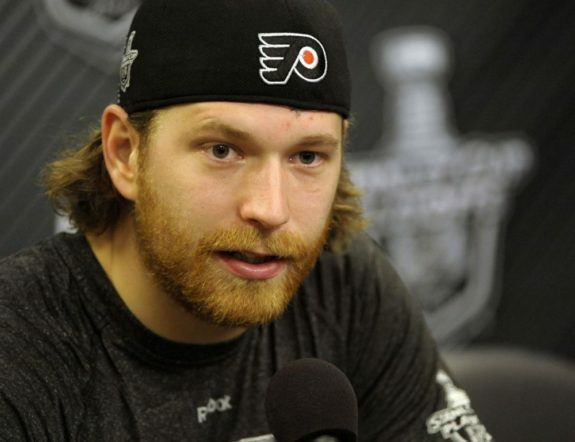 Unfortunately, the 2012 lockout was not kind to Giroux or his Flyers. Coming off surgery on his wrists the previous summer, he suffered a neck injury playing in Europe during the lockout. He sat out until NHL play resumed, but he and his team got off to a slow start. They lost their first three games, so Flyers brass tried to shake things up. They fired Laviolette and replaced him with Craig Berube. Giroux picked up his play after Jake Voracek joined his line and finished the 48-game season with 48 points. It wasn’t enough, though, as the Flyers missed the playoffs for just the second time since 1994. Nonetheless, the Flyer gave Giroux an eight-year extension during the offseason. The next year was a bit better for him and the team. The lockout enabled the Flyers to buy out Briere and Bryzgalov, who had failed to live up to his huge contract. Steve Mason took his place, while the Flyers signed Vincent Lecavalier to replace some of Briere’s production. By March, though, it looked like another early offseason for the Flyers. But Giroux led the league in scoring during the month of March, and the Flyers went 9-3-2. They finished third in the Metropolitan, just one point ahead of the two wildcard teams. Flyers lost their first-round matchup to the eventual Eastern Conference champions, the Rangers, in seven games. Giroux was fairly quiet; one of his two goals was an empty-netter, and all four of his assists were secondary. During that offseason, Ron Hextall became GM. He traded Hartnell that summer, and the offense suffered. Giroux scored 73 points, his fewest in a full season since 2009-10. For the most part, the team hovered at around .500 and failed to make the playoffs once again. Some fans began wondering whether Giroux really has what it takes to take this team deep into the playoffs. The 2015-16 season was similar, but a strong February and March helped the Flyers secure the final playoff spot. Giroux finished with only 67 points that year, another drop-off. But the Flyers played well in their first-round matchup against top-seeded Washington, taking the series to six games before losing. Giroux, however, was invisible. He finished the series with just a single assist. He had surgery that summer, although he refused to blame his performance on injury. In 2016-17, Giroux’s fifth as captain, the team missed the playoffs once again. It was the first time in more than 20 years that the Flyers missed the playoffs twice in a row. His 58 points led some to believe—or hope—that his recent struggles really were due to injuries. They can only hope that he’ll finally regain his form in the upcoming season. Hextall seems to have brought the Flyers to the verge of sustained success, but that will depend largely on Giroux. He needs to be the team’s best player if they’re to return to the playoffs in 2018. In fact, his future with the team may depend on it.